Considering that 'there is no demand' for an English Parliament (according to Lord Falconer), this BBC talkback seems surprisingly busy, 16 pages of posts so far, and still going strong. The BBC poll (a snapshot taken a few minutes ago is shown above) gives the lie to Lord Falconer's assertation that there was no demand, it's currently running (as of 11th March at 11:15ish am) at over 2 to 1 in favour, given the number of votes, expect a 2-3% error on the numbers in the poll (assuming a random sampling error). Of course, a more systematic poll would be needed to be truly valid, but this looks like a pretty clear message. Unfortunately, no major party takes this view. Labour sees no need, and the Tories was to split westminster. 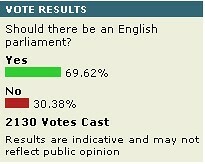 Ideally, I'd like to see England/Scotland/Wales on an equal par, with the UK parliament being a true UK parliament - i.e. it's legislation equally affects all parts of the UK. Older PostBishop of Winchester replies - Legislative and Regulatory Reform, Glorification and ID cards.